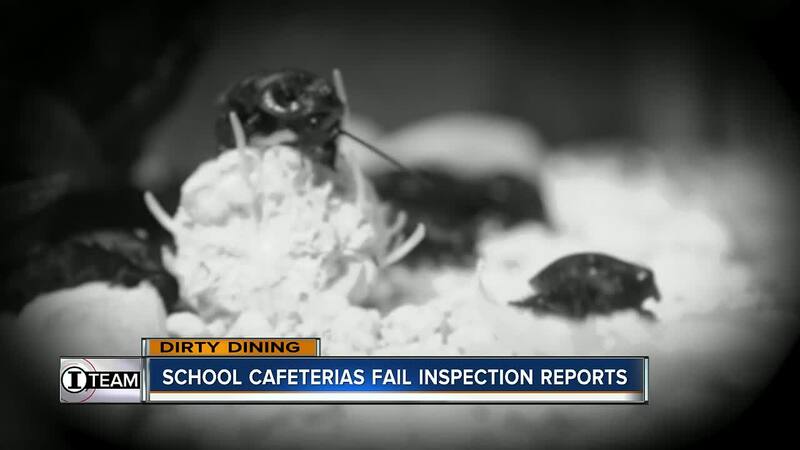 Dozens of area school cafeterias and concession stands are failing to make the grade with reports of live roaches, rats and rodent droppings, but a Dirty Dining special investigation found inspectors failed to shut down school kitchens for those violations. TAMPA BAY, Fla. — Dozens of Tampa Bay area school cafeterias and concession stands are failing to make the grade with reports of live roaches, rats and rodent droppings, but a Dirty Dining special investigation found inspectors failed to shut down school kitchens for those violations. 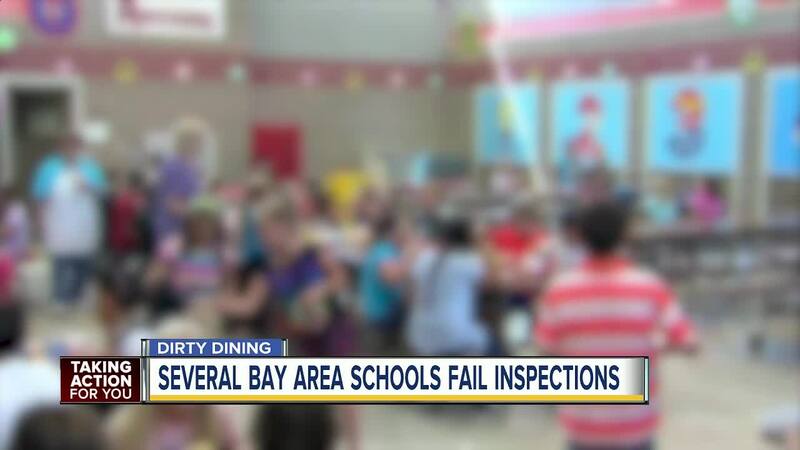 Anchor Wendy Ryan spent months combing through more than 600 school inspection reports and discovered schools in six of the largest counties in the Tampa Bay area failed health inspections in just the past year alone. Polk County had nine schools fail the latest inspections. A rat was found running inside Auburndale High’s concession stand. Live roaches were found in a kitchen at Sleepy Hill Elementary as well as inside the refrigerator and freezer at the football concession stand at Tenoroc High. In Citrus County, two schools did not pass inspections with rodent droppings found in one kitchen, while Hernando, Sarasota and Pinellas counties each had one school that failed its latest inspection. Hillsborough County had 10 schools fail inspections this year and inspectors found dead cockroaches on floors and bathrooms inside Lavoy Exceptional Center. The school also had no hot water – a common violation among cafeterias that failed inspections in Hillsborough. When state health inspectors find rats, roaches or no hot water in a restaurant, it’s immediately shut down. But the Dirty Dining investigation found school cafeterias with those same violations stay open. “I don’t recall a Hillsborough County School being shut down,” said Doug King, Hillsborough County inspection supervisor who has worked for the department for more than two decades. “Well, I don’t recall one being shut down,” King said. And the investigation found the same story in Polk County. “That’s extremely rare for us to have to actually shut down a school operation,” explained John Cook, who’s in charge of all Polk County inspectors. The Dirty Dining investigation also uncovered Cook’s team, which gives a passing or failing grade to all school cafeterias in Polk County, waited up to six weeks to reinspect some of the schools that received failing grades – a practice Cook defended. “I’m confident with the inspectors we have that we are finding the problems that are out there and seeing to it that they’re corrected,” Cook said. All of the schools highlighted in this report later corrected the health violations cited. However, county health officials check school cafeterias and concession stands on a rolling basis with new inspections – and the potential for new violations – up to three times a year. You can also click here to find out if your child's school has a satisfactory or unsatisfactory grade. "It's important to note that the health department inspects nearly 200 Polk schools with food service operations leading to about 800 quarterly inspections per year. Our schools are responsive to inspection findings, making corrections promptly and generally doing a great job. These 10 unsatisfactory reports were resolved quickly and do not fully reflect the state of the schools food service environment. " "School cafeterias are inspected three times per year. Some other food facilities with limited food prep at schools, like concession stands, are twice per year. All were routine inspections. I also checked to see if there were any reported illnesses linked to any of the schools. We have not had any reported illnesses from any schools in the past several years." "We typically do not shut down school cafeterias with an unsatisfactory result... Because school cafeterias need to be able to serve meals to the students, we work very closely with them, if and when, a serious situation involving food safety is determined. This may involve staying onsite until the situation is resolved, or ensuring safe food can be brought in from another facility until corrections are made." "The Florida Department of Health in Pinellas County works closely with school cafeterias to ensure students are served safe meals. Any violations that could create an imminent health threat are monitored for corrective action which could involve a school being required to obtain food from another licensed facility until the problem is resolved... Pinellas Prep was able to have the malfunctioning milk cooler repaired so that it maintained proper temperature to then receive a satisfactory inspection result. They had another properly functioning cooler on site for storing milk during the time when the cooler in question was under repair." "I do not recall ever closing a school cafeteria for any reason... If one was shut down then they would have to correct the violations, another inspection would be scheduled and then if every item had been satisfactorily resolved then we would open them back up." "Any facility that is issued a stop sale notice, may correct the violations. An inspector will go onsite and determine if those violations have been satisfactorily corrected, then the stop sale notice will be rescinded and food operations may resume... Citrus High School Football Concession Stand corrected all of their violations, i.e. we asked for them to clean the ice machine and they did... They have addressed every item on the inspection form and have been found to be satisfactory." "DOH does not issue grades for kitchen inspections. An inspection outcome will be satisfactory or unsatisfactory. When serious deficiencies or unsanitary conditions are observed, DOH inspection staff work with school kitchen managers and school board facility staff to ensure corrective action is taken immediately... DOH-Sarasota has not shut down a school kitchen. However, if and when food items are observed to be potentially compromised or unsanitary conditions exist in a kitchen, affected food items are required to be discarded and appropriate corrective action taken to ensure safe and sanitary food preparation. Sarasota County School officials always readily respond to deficiencies identified by the health department and make necessary corrections. Subsection 381.0072(6), FS, provides the Department with enforcement action through the issuance of a stop-sale order. Additionally, subsection 381.0072(5), FS, provides the Department authority to suspend or revoke a license, or impose administrative fines." "The most recent violation at Emma Booker that required a recheck was a violation on 4/30/18 whereby the water at one of the handwashing sinks was not hot enough. Kitchen manager put in a work order to the maintenance department to get the matter resolved. Upon the Inspectors return the following day, the hot water temperature was adequate." "The Department has never shut down a school cafeteria in the County. Hernando County Schools have been very responsive to maintaining the public health and safety of Hernando County students... For all food service establishments under the jurisdiction of the Department of Health, the Food Establishment Inspection Report is utilized. The report is completed by a Certified Environmental Health Food Protection Specialist utilizing Chapter 64E-11, Florida Administrative Code, "Food Hygiene." [floridahealth.gov] If a violation is found, the specialist explains the violation to the facility on-duty lead member and educates this person on the science behind how and why the violation needs to be corrected such as potential health impacts to protect public health and safety. Corrections are made on-site or completed before a follow-up inspection as dictated by Chapter 64E-11, Florida Administrative Code, "Food Hygiene." [floridahealth.gov] In the case of a critical violation if deemed necessary, the following actions can be ordered under the jurisdiction of the Department of Health, including (but not limited to) the immediate order of a stop-sale and destruction of food, an immediate closure of the facility or fines. FL State Statue 381.0072 Additionally, all inspections are maintained electronically and can be viewed here [floridahealth.gov]." "The document requested by ABC Action News in regard to an unsatisfactory grade at Hernando High School on March 21, 2018 was in reference to Hernando High School Food Production. This is a cooking class at the school and NOT the school’s cafeteria. The cooking class did not have required thermometers in refrigerators. Following the inspection, the thermometers were ordered and placed appropriately."